PHOTO: Allen Ramsey, DWCPhoto.com. Highlands senior quarterback Austin Hergott (7) fires off a pass while offensive linemen Nathan Raleigh (60) and Michael Dunn (73) watch. Hergott completed 14-of-23 passes for 210 yards and three touchdowns in the win. PHOTO: Allen Ramsey, DWCPhoto.com. Highlands defensive backs Bradley Greene (86) and Austin Beal (27) point toward the other direction after teammate Sam Taylor (below Beal) recovered a Boone County fumble on the opening kickoff in Friday's game at Boone County. FLORENCE - On the whole, a 5-5 record may be considered a down year by Highlands football standards. The Highlands Bluebirds had to beat the Boone County Rebels on Friday to finish with that .500 record. They did it scoring 18 consecutive points in the second half to pull away for a 32-6 victory. Highlands had not finished a regular season with that record since 1952. The Bluebirds also had not lost five games in a season since 2006. But the good news is the Bluebirds have overcome their first 1-5 start since 1939 with four straight wins entering the playoffs. That includes extending the winning streak over Covington Catholic to 14 in a row and extending their district winning streak to 31 straight for their 19th district crown in 20 years. Outside Class 5A, District 5 action, Highlands played competition from Kentucky's largest Class 6A going 2-5. The five wins came against teams with losing records of a combined 10-40 and the five losses came to teams with winning records at 41-9 overall. So the biggest question mark entering the playoffs is how Highlands can stack up against teams with winning records. The Bluebirds take on Woodford County at 7:30 p.m. at David Cecil Memorial Stadium on Friday to open the Class 5A playoffs. Should Highlands beat the Yellow Jackets (3-7), the Bluebirds could face the only team in Region 3 with a winning record in the Montgomery County Indians (7-3) in the second round. 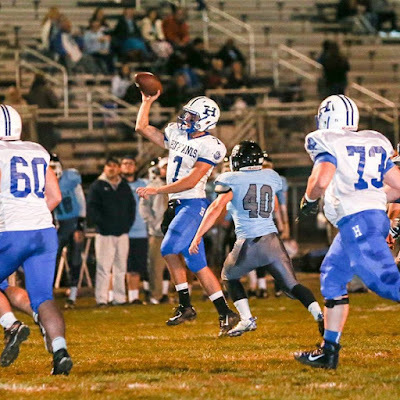 The Indians handed the North Laurel Jaguars (9-1) their first loss of the season, 26-14 in London on Friday. Montgomery County plays host to Dixie Heights (2-8) on Friday at 7:30 p.m.
That left no undefeated teams in Class 5A. North Laurel, Defending 5A state champion Pulaski County, Bowling Green, Owensboro and Louisville Fern Creek all finished 9-1. Pulaski County's lone loss came Aug. 28 to Scott County, 53-31. The Maroons have held five teams to eight or fewer points. 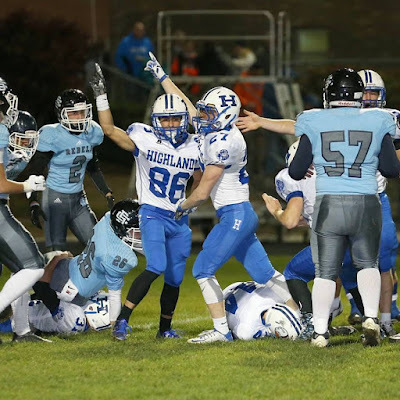 Highlands could see the Maroons in Fort Thomas in the state semifinals Thanksgiving Weekend if both teams win their respective regions. The odd region plays host to semifinal games in odd years. The best news for Highlands is the Bluebirds would play in the comfort of David Cecil Memorial Stadium in the first four rounds of the playoffs if they keep winning. Should Highlands and District 6 champion Madison Southern (4-5) meet in the region title game, Highlands would play host because the team in the odd district plays host in odd years. Highlands has beaten CovCath four straight years in the region title game. The Colonels hit the road and beat Johnson Central in the second round of the playoffs the last three years. But CovCath is struggling this year at 3-7. The Colonels take on Anderson County (5-5) to open the playoffs and Madison Southern takes on Grant County (4-6) to open the playoffs. Two playoff wins guarantee Highlands its 59th straight winning season dating back to a 4-5-1 mark in 1955. The Bluebirds have to win the 5A state championship to avoid their first six-loss season since 1948. Bowling Green and Owensboro are the favorites to come out of the western side of the bracket. Bowling Green edged Owensboro, 17-14 on Sept. 11 in Bowling Green. But teams like Christian County, South Oldham and Fern Creek can't be counted out. The Class 5A state championship will be Dec. 5 in Bowling Green at either 7 or 9 p.m. Eastern Standard Time. The time depends on whether Western Kentucky University's football team plays host to the Conference USA championship game or not. Highlands improved to 35-3 all-time against Boone County in the first meeting between the two since 2010. The teams have played just seven times since 1984. The played on an annual basis between 1955 and 1984. All three Rebel wins came in the 1970s with the last one coming 14-8 in 1979. Highlands entered the season just 23 victories shy of Valdosta High School in south Georgia for the most wins in program history in the country. Valdosta defeated county rival Lowndes County High, 17-7 on Friday to move to 6-3 on the year meaning the Bluebirds have lost just one game on them. Valdosta moved to 897-219-34 all-time and Highlands moved to 873-234-26. Valdosta needs to win its last game of the regular season Friday then win two playoff games to become the first program in the country to reach the 900-win plateau. Highlands senior placekicker Jared Dougherty booted three point-after touchdown kicks against Boone County to move his Highlands and Northern Kentucky record to 185 made PATs for his career. That mark ranks 10th in Kentucky history. Dougherty moved past former Boyle County and University of Kentucky kicker Taylor Begley's mark of 183 in the win. Next up is 188 career PATs by John Hardin graduate Alan Harber (2006-2009) and Lexington Catholic graduate Brian Behr (2002-05). The Highlands freshman team concluded the regular season with a 28-22 loss to Campbell County finishing the year 7-3 marking a four-win improvement from last year. The junior varsity team finished the season 7-2 marking a six-win improvement from last year.